For fun today, we’ve got an excerpt from the new romance novel, A Chance of Fate, by Emleigh Walsh. Read on to find out more about the book and see where you can pick up a copy! He made it across to the brick building housing a group of local businesses. He put his forehead on the wall and waited for her to pass. He felt her walk cautiously by; he felt her eyes on him the whole way. He felt her turn the corner and go up the cross street. Eventually, after he could no longer feel her near, he gathered his control and turned around to stare where she was. He could hear the fear in Eric’s voice as well. Truth be told, he was pretty frightened when he thought about what could have happened. “It’s her,” he said, with awe, still staring at the spot he’d last seen her. Purchase the book at Amazon in Kindle or paperback format. Also available for Nook. Don’t get me wrong. I love posting stuff about the writing community but once in a while, it strikes me that it would be fun to just post about things I like in a non-review or informal format. And so I’m going to start sharing with all of you three things I like once a week. These aren’t meant to be incredible works of blogging art–just stuff that I think is interesting and that some of you might like as well. I know I’ve talked about this band before but I love them. I’d see them in concert if I could actually ever seem to afford the tickets when they’re around. I wish I could use their music in my book trailers! Beats Antique is a band with a strong Middle Eastern influence. The first song that I heard of theirs was “Egyptic” and it hit me at exactly the right moment. I’d been struggling with a scene set in the Anjduri Empire and something about that song jogged my block loose and I started writing again, hit the next song on YouTube and kept going. The only music that I listened to when writing The Jealousy Glass was theirs. (Fortunately, for my family, they have a lot of albums.) Likely, I’ll listen to them again through The Oracle Bones and I’m not ashamed to admit that their song “Roustabout” is an inspiration for yet another project I’m working on. Interesting, since this isn’t necessarily a genre of music that I listen to often (in spite of how I’ve just gushed about this particular band). Anyways, here’s the song that started it all for me. Go buy their albums. At the very least, take advantage of one of their free downloads which you can often find at their website. This might be more accurately said to be that I like Smithsonian blogs, now that Paleofuture has become one of them. Smithsonian blogs are generally among my favorites because I love history. And I love it more when I can get it in bite-size pieces like a snack for my brain. So why paleofuture? Because I am fascinated with how past people viewed the future. It says so much about a culture and how they dream when you glimpse these visions from previous eras. My one quibble about this blog is that I wish it could go further. I’d love to see more of other cultures and what their ideas were about what was coming. History is often prophetic and one wonders what sort of science visions places like Japan or Africa have had about their own futures. But I still LOVE it. I mean, where else are you going to read about the “scientific mating” of the 1920s? 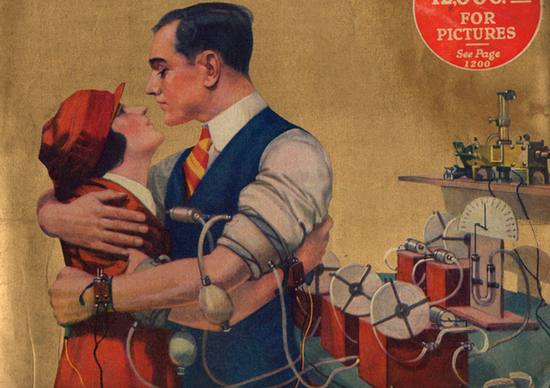 “Scientific Mating” on the cover of the April, 1924 issue of Science and Invention magazine. Courtesy of Paleofuture. I am neither an artist nor a photographer–never will be–and I’m always in awe of those who have those talents. There’s the saying that “a picture is worth a thousand words” but I have to tell you that one of my pictures is worth about 5 words. Maybe 10 if you’re lucky. Because of that, I find good art and photography very precious. This isn’t a choice that I would make but I can respect the desire. There is something about running to the wilderness that you cannot capture in the cities, with the constant rush and noise. Noise exists in the woods but it’s a different thing altogether. I know that when I’m standing out on Hood Canal, sometimes it feels like the only time I really breathe. The air is different there. The woods to me are haven. In part, I think that’s why I wouldn’t choose to leave the grid–I would lose that sense of reaching heaven every time I walk into a thick glade of trees. That said, there is much to admire here and I think that all of us could stand to consume a little less electricity and a lot more sunshine. On that note, I’m off to do so myself! Alan Dale is doing a remarkable interview project with hundreds of authors. Here’s a sneak peek at his interview with yours truly. This afternoon’s post brings us Nicole Storey who has written a YA story inspired by her family’s experiences with autism. 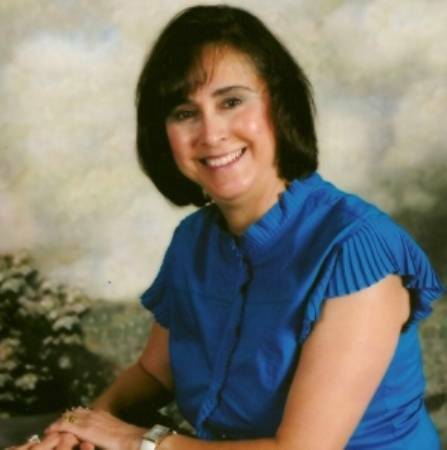 I am honored to have her on my blog speaking about both life and the novel that came from it, Grimsley Hollow – The Chosen One. Please welcome Nicole! Gwen: Thanks for joining us, Nicole! Tell us a little bit about your story. 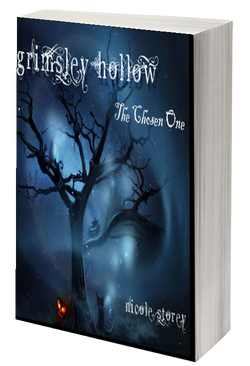 Nicole: Grimsley Hollow – The Chosen One is book one of the Grimsley Hollow series. The story’s main character is an autistic boy named Gage. He has always been relatively happy and secure in his life, but craves adventure and friends. He meets a young witch who invites him to her world – Grimsley Hollow – which is in danger. Unknown to him, Gage’s autism gives him special powers and he is the only one who can save this magical world and the fairy-tale beings and creatures who call it home. It is classified as juvenile fantasy and is for kids ages ten and up. Gwen: Gage, the main character, is autistic. This isn’t a common theme in speculative fiction—the only other novel I can think of offhand that covers this (and it’s definitely not YA) is The Speed of Dark by Elizabeth Moon. What kind of response have you gotten from YA readers? Nicole: The response has been very positive. The character, Gage, is actually my own son. He was diagnosed with autism at the age of three. I wanted to write a book that shows special-needs kids in a true light. Many of the books I’ve read with autistic characters paint them as emotionless or as idiot savants. My hope is when people read this book (especially kids) they realize that special-needs children are no different than they are. I hope they see the similarities in the characters and themselves and will include these amazing kids in their lives. I tried to portray in the book that everyone is different in some way or another – that we all have strengths and weaknesses. Gwen: Tell us something about Gage that we don’t learn in the story. What’s something that he loves? Something he hates? Nicole: The character in the book is a fairly true depiction of the real Gage. Something that I have not disclosed in the story yet is that he obsesses over things. It can be anything from a movie to an imagined health problem. It is constant and ever-changing. This month, he really hates storms – although they have never bothered him before. He watches the Weather Channel constantly to see when it might rain. Next month, it could be a video game he has to beat, or a favorite food he wants to eat over and over. We’ve learned to roll with the punches by now! LOL! Gwen: Some of the most wonderful things about your story are all the details and emotions that you slip in—how Gage has better senses or how his mother often wonders if his life would be easier if he was more disabled. Did you draw from your own life to create a sense of this world? What were some of the challenges you faced in telling this story? Nicole: Yes, everything (autism related) is absolutely true. I think the most challenging part was how much to put into the book. I didn’t want the reader to become bored or feel that autism was being pushed in their face, but I also wanted to add enough so that everyone would gain some knowledge of the disorder. Gwen: The Chosen One also has a number of fantastical elements in it, from witches to werewolves to pixies. Do you have a favorite race among them and why? Nicole: I am a huge fan of Halloween and I love all the beings that represent the holiday. I would have to say that witches are my favorites because of the magic that surrounds them. Gwen: What plans do you have for future books? Can you share with us a taste of what might be coming up? Nicole: I have a new short story/novella that’s in the editing process right now. It is a prequel to my first book and is titled Grimsley Hollow – Eve of the Beginning. I also have another book in the series that is due out this fall titled Grimsley Hollow – The Search for Siren. After that, I plan to write a stand-alone novel that’s unrelated to the series. It is a YA Paranormal book. Gwen: What is the best place for readers to find out more about you and your work? Blog: http://nicolestorey.wordpress.com/ (I mostly use my blog for book reviews and updates on my writing). When I saw that Belinda Vasquez Garcia had written a book about witchcraft and the Great Depression set in the American Southwest, I just HAD to talk to her. As some of you may know, I just curated an exhibition on the 1930s so I’m a little addicted to the period. 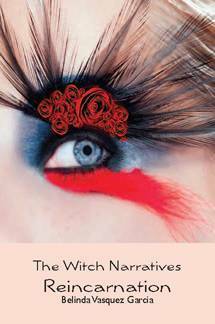 Belinda’s novel, The Witch Narratives: Reincarnation, is full of fascinating concepts. She’s here today to talk about historical connections but watch this blog to hear more about the book. Some Southwestern witches shape-shift using a piedra imán, those lucky enough to find the rare magnetic shape-shifting stone, whose powers go back to Roman times. In crafting my story, I thought that if a woman had such a stone, she would use it to remain young and beautiful. If one could remain forever young, then immortality would follow. So, in my books, a piedra imán acts as a fountain of youth. I therefore, needed to have my series start in an earlier time period so the lucky owner would stay young, while other witches around her age, festering with jealousy. For the first book, one of the time periods I chose was the Great Depression. Like most rich men, my fictional owner of the town and coal mine, Samuel Stuart, is not affected as much by hard times because he, also, owns businesses in Albuquerque, though some have closed due to the depression. However, his bank in Albuquerque, of which he is part owner, does fail and has to close its doors, even though the eight-story First National Bank is the biggest in Albuquerque. Here comes the Calvary! Lo and behold, the government and Roosevelt come to the rescue with the Glass-Steagall Act and loans money to banks all over the country, allowing the rich mine owner to reopen his bank. Hmm, sounds familiar, doesn’t it? Well, the Glass-Steagall Act which saved the banks from entire ruin during the Great Depression bailed them out, so long as the banks agreed not to dabble in investment banking and underwrite securities. Wait a minute! That’s what banks were doing that caused our current economic problems! I found it unnerving that during my research I discovered that the economic crisis our nation has been having the last few years is simply an echo of the past. It was rather daunting to see how history repeats itself. Two young women, a witch and a Catholic, clash with the Penitentes, a fanatical, Catholic secret society who enforce their own punishment for sin. Salia, a third-generation witch and half-breed living on the fringes of society with a cruel mother and selfish grandmother, befriends Marcelina, a doubting Catholic haunted by a centuries-old witch, La Llorona, who rises from the muddy Rio Grande. While Marcelina is torn between Catholicism and witchcraft allure, Salia has no desire to join the Sisterhood of the Black Rose, the covens created by La Llorona. Belinda grew up in Albuquerque. The daughter of a seasonal carpenter and housewife, her family never had much money. Growing up, the only books her family ever owned were the A and B encyclopedias, and Webster’s Unabridged Dictionary, which she used as a stool to sit on. Thus, did she absorb an arsenal of words. She was seven years old when a neighbor loaned her Tom Sawyer. The novel mesmerized her, and she spent her summer days, sitting under a tree, reading the book from cover to cover ten times, before surrendering it. She then badgered her brother to walk her several miles to the library and several miles back, so she could check out other books of spell-binding fiction. She was skinny and often hungry, but nothing could keep her from that library walk, and the pile of books she would carry back home. Her father deserted the family when Belinda was twelve, and her mother died when she was sixteen. Still, she earned a Bachelor’s degree from the University of New Mexico with emphasis on Applied Mathematics. As a child, her family often spoke of witches. They particularly told tales of the legendary, centuries-old witch, La Llorona, who fascinated Belinda. Thus, her inspiration is taken from the true tales of witchcraft she heard as a child, from a strong Native American influence in her youth, and through research. Her fictional work reaches beyond regional geography to entice anyone who enjoys the world of mysticism, and the power of sorcery, but with spice. Her vision is to fashion colorful and realistic characters, and create compelling worlds that speak of sorcerers, witches, spiritual journeys, human compassion, individual frailties, love, hate, and the importance of family. One of her goals is to deeply touch the emotions of her readers. Before embarking on writing full time, she worked as a Software Engineer and Web Developer for Sandia National Laboratory. In her spare time, she honed her craft of writing fiction. Take an adventure you will never forget. Journey through The Serpent Passage, a sci-fi novel set in the times of the ancient Maya. When William and Betty are trapped in a cavern in the Yucatán, they discover a way out through a strange passage that propels them a thousand years into the past. While searching for a way home, they become entangled in conflicts between Mayan kingdoms. Priest Quisac agrees to aid William if he promises to help his people. William is awarded the bloodstone, a magical gem that puts him in the path of Mayan gods and demons. Can William survive the challenges of the past long enough to return home? Will his love for a Mayan Princess complicate matters? How is William’s destiny tied to the end of the Great Cycle in 2012? The Serpent Passage is the first book in the Serpent Passage Series. Todd grew up in the Northwest, where he used to write stories to entertain his family. He has a B.A. in Communications and worked in technical publications for most of his career. 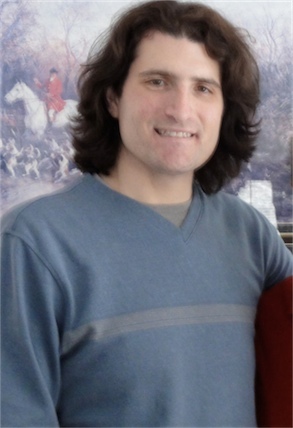 Over the years, Todd wrote numerous technical manuals that have been published in print and on the internet. His success as a technical writer led him to managing large technical publication departments. Throughout his professional career, Todd continued to write fiction. Todd was inspired to write The Serpent Passage while exploring Mayan ruins and working as a scuba instructor in the Yucatán. Visit the book page on Amazon! I decided that, although this blog is largely focused on writing, I’d share something about my personal life as a change of pace. Namely, my ability (or lack thereof) to bake. This particular recipe was written a long time ago so I’m no longer taking classes. I still have lots of other reasons to slack and bake pie, however. Warning: as with any time I cook, there may be mild profanity involved in the recounting of this process. For me, baking and slacking are synonymous. This is why I like baking pies. They require minimal effort (unless I’m making the “Dark as Your Soul” pie- that recipe for another day) and generally come out alright for me. If sometimes lopsided. This particular pie, originally dubbed “The I Hate Statistics and Am Totally Slacking Pie” ended up being completely different from the original recipe since I didn’t actually check for ingredients before I started making said pie. As a happy side effect, however, the leftover pie filling can be used to make a lovely nectarine curry! (Yes, you heard that right. Nectarine and curry.) So I’ll include that recipe at the end – think of it as a special bonus. 1. Combine coconut milk, sour cream, sugars, flour, and salt in a heavy saucepan. Bring to a boil over low heat. 2. Remove from the heat. Stir in coconut and vanilla. 3. Pour into a pie shell and chill 2 to 4 hours or until firm. At some point, you probably should’ve baked the pie shell. I don’t know what happens if you don’t given that I’ve been telling people for years that eating uncooked cookie dough will make them sick and it never does. 4. (optional) Can top with more coconut. 2. Bake the pie shell. The pie shell cracked instantly-at which point, I decided to shove the sides together in the hopes that it would grow back. This does, after all, work with fingernails sometimes and assorted medical emergencies- it stood to reason that it would with pie. 3. Forget to prick the pie shell with a fork. Open the oven, nearly trapping the curious cat inside, and prick said pie shell. Close oven and wonder exactly what the phrase “golden brown” means. 5. Look at recipe. I realized that I didn’t actually know what a heavy saucepan was. Chose to evaluate this by weight of pan. Chose one that seemed appropriately heavy and set it on the oven. 6. Peek in oven and notice that crust is bubbling. Pretend this is normal behavior and go on with life. 7. Gather ingredients while waiting. Get impatient with crust and put it on the counter because it looks golden enough. 9. Look up possible substitutes for eggs on the internet. Mayonnaise is recommended. I hate mayo. I decide instead to substitute 3 tablespoons of sour cream for one egg (same ratio as mayo). After all, sour cream looks like eggs. This will work. 10. Realize that don’t have a lot of sour cream anyhow. Make it 5 tablespoons instead (in retrospect, could’ve probably even done 4). 11. Have been banned from using toaster oven this week and as a result, in the meantime, have put coconut in pan in the oven to “toast” it. Stare at its downy white flakes, thinking it would be much more awesome lit on fire. 12. Look at the crust which is actually quite pretty. 13. Start working on putting all the ingredients in the newly dubbed “heavy saucepan.” If you really want to replicate this exact recipe, I suggest you do a really crappy job of shaking the coconut milk. After you see the crappy job you did with the first can, just dump the second can right in without shaking it at all. You’re going to stir it anyhow. 14. Stare at coconut again. White, white coconut. Make decision that you will never make macaroons. 15. When daughter tells you that you need to add one tablespoon of brown sugar to cut the recipe and counter a mild salty flavor, obey. 16. Take coconut out of oven because it’s just been forever. Applaud self for the two strands of golden brown texture. 17. Stir mixture in saucepan. Realize that leaving it on low heat will never actually get it to boil. Crank the heat up. Then realize that it must be on low so as not to burn something. Turn it down. Wait. 19. Get it to boil. Put in your coconut and vanilla after taking it off to cool, then pour in pie crust. Chill in freezer until it’s nice and hard. As mentioned above, the great thing about this recipe is that you’ll have leftovers. You can take it and make an awesome vegetarian curry! This would be great for anyone who likes a creamy, very mild sauce with a sweet flavor. I think that it would work well with pork but I didn’t have any. Just leave your pie filling in your heavy saucepan and throw the other stuff in. Mix up and heat to a slow boil on medium heat. I just served it over noodles but it’d probably be great over jasmine rice.